As I mentioned in another post there are 16 candidates in the running for President of Liberia. Actually, President Sirleaf was in Yekepa a week ago though I did not know it until the next day so I did not go to see her. Another candidate from Nimba County, where ABCU is located, is Prince Johnson. I find this quite interesting because the students call him a warlord and the newspapers call him a rebel leader who was an active participant in the war. 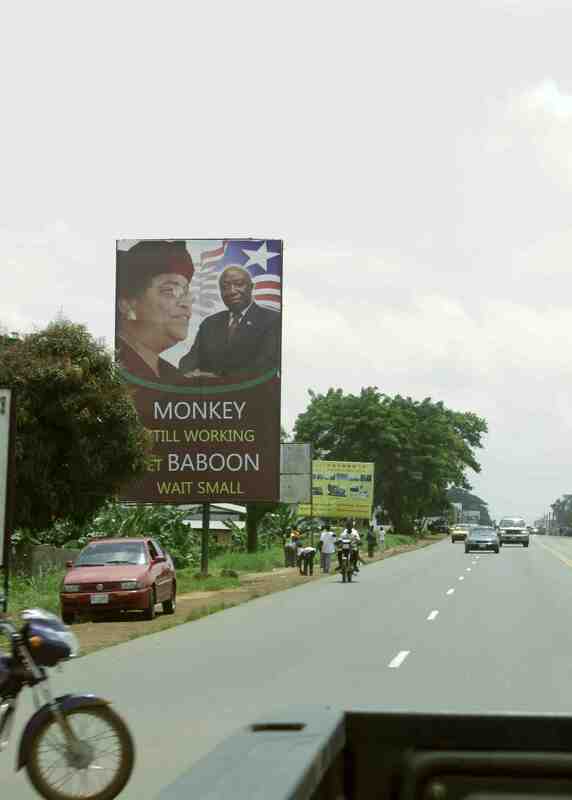 “Monkey Still Working Baboon Wait Small” is one of the campaign slogans of President Ellen Johnson Sirleaf that is plastered across Liberia. What does this mean? The implication is that she needs another term in office to be able to complete all of the work that she needs to get done for Liberia. According to one website that I read, “It usually refers to the working underclass, poor and disenfranchised working like slaves for peanuts while the few at the top enjoy themselves at their detriment” (In Profile Daily). Of course her critics are responding, “Monkey is suffering. Do not cheat. Your time is over.” Others are saying that they are not monkeys but human beings and should be treated as such. The latest twist to the election, which is suppose to be on Oct. 11, is that the Supreme Court is deciding if six of the candidates can remain on the ballot. One of these candidates is the current President, Ellen Johnson Sirleaf. The constitution says that a candidate must be a resident of Liberia for at least 10 years before the vote occurs. This mandate was waived for the last election, because so many of the qualified people had been in exile during the war. Interestingly there was a referendum vote in August to overturn the 10-year requirement but the people voted no. Critics are arguing that the people did not understand what they were voting for and others argue that the people have spoken. The Liberian Supreme Court was suppose to rule last week but said they needed longer to decide. Supporters of the six candidates who might be taken off of the ballot because of the 10-year rule are saying that violence will occur if their candidates are removed. If the six candidates are removed, which I doubt, then one of the top leaders will be Prince Johnson, who I referred to in an earlier paragraph. Hmmm the election is in a week, I wonder when the Supreme Court will decide???? The Women Coalition for Peace is working to maintain calm across the nation. They have been calling on the media to promote peace and not to stir up trouble. Thank goodness for mothers, sisters, and daughters that know the value of peace in this fallen world. According to Afric Diasporia, “Liberia was founded in 1847 by the American Colonization Society (ACS) to settle free slaves from the Americas. Since independence, about 18 of the country’s approximately 23 presidents were born in the United States. The country’s first president Joseph Jenkins Roberts was born in Virginia, USA; and the capital of the country was named after former U.S. president, James Monroe. A cross section of Liberians has American citizenships; that includes current president Ellen Johnson-Sirleaf and a host of officials within her administration.” So as you can read, the U.S. and Liberia are very interconnected. Our students will have off Oct. 10, 11, and 12th so that they can go home and vote. This gives them time to travel to their homes to vote and hopefully make it back to school by Wednesday evening. Travel is not easy and what might take us five or six hours will take them all day or a couple of days because of road conditions; it is the rainy season. To get home they will have to squeeze into a cab with multiple other riders, take a motorcycle and/or walk. 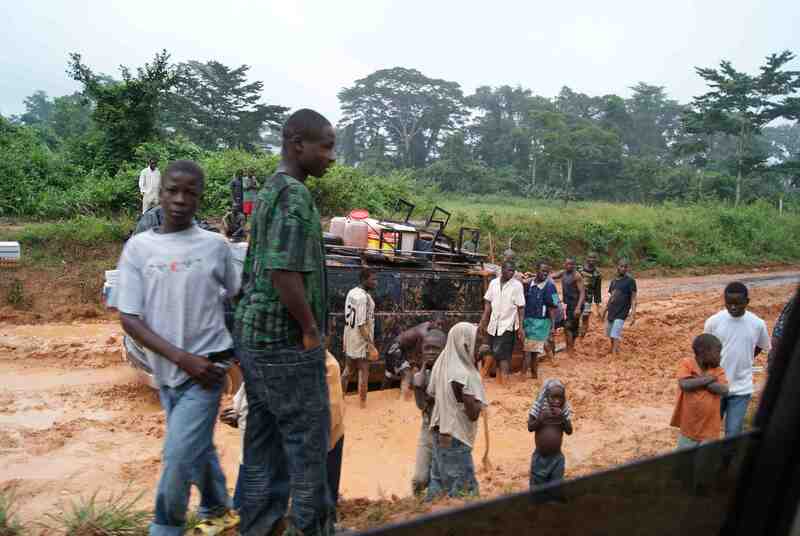 It is likely for many of our students that they will have to use all three modes to try to make it to their villages. The hard part for us is that we have to make up all of the classes that they miss, plus teach our regular load. To win the election a candidate has to receive over 50% of the vote and with 16 candidates there will probably be a run-off vote in November. This means that once again we will have to give students three days off to vote and make up all of the classes. TIA (this is Africa). Pray for a peaceful election. May God’s will be done in this country.